Filed under: A Teens View on Jewish Education, The Millennial Generation. The first Yeshiva type wedding band! A very rare photo of my father and his pirchai band. Manny Greeble, Chaim Fessel, Feivie Mendlowitz, Elliot Frankel. Not many people can say that they literally grew up in a music studio. I can. While most children’s basements have toys, mine contained a mic and mixer. Being able to stay up late to watch Avraham Fried, Shmuel Kunda, The Piamenta's, 613 Torah Avenue or many of the others who recorded there, is a part of my childhood I would never trade for anything. But it was the composers who truly inspired me. I never could understand how a human whose brain is made up of just neurons and electricity can suddenly compose music. Chazal tell us that what makes us different from the animal is that we have the ability to communicate. But animals communicate and so do computers. I believe that chazal is referring to the ability of the methodical process of logical reasoning, to create abstract thoughts. It's the forming of new ideas that makes us as humans stand apart, whether divrei torah, poetry or a beautiful song. That original thought, that spark, the Tzelem Elokim allows us mortals to discover new ideas. The Jewish music scene has had incredible composers over the years that have touched every one of us. Shlomo Carlebach, Abbei Rottenberg and Yossi Green are just a few of the greats. I have had the privilege of spending quality time with them and I believe I was lucky now to meet one more. This week I began an online conversation with a 17 year old boy from Yeshiva Far Rockaway. He sent me a link to some songs he created, both melody and lyrics, and I was amazed. His songs created such emotions that its hard to believe it came from a boy this young. It captures so much of our daily struggles and our hope. So how does somebody create something so powerful? Who plants that song in a composer's head? What gives us the ability to create something that captivates the eyes, minds and hearts of others? In a fascinating new book, “Imagine: How Creativity Works, Jonah Lehrer, addresses that question and explains how that big 'Aha!' moment comes to be. During rest period the brain takes all the information it gathered during the day and, without us being conscious of it, creates something from the chaos. In the first chapter, he explores the creative mind of Bob Dylan and shows us that when a composer thinks that it all just “popped into his head”, it really is a combination of all his thoughts and actions all wrapped up together. And so I was intrigued and wanted to know how this boy can compose such emotional songs that touch the heart. After a lengthy conversation he was convinced to give us some insight into the world of Jewish music as he sees it. His songs are linked from this article. Leave comments and he will try to respond. Thank you, Yaakov. As cliché as it is to say that “music is the language of the soul”, or “there are gates in heaven that only open to the sound of music”, it is all true. Music has the power to lift us up to the best of spirits and make us smile, to push us to the edge of emotion and stir us to tears, to inspire, and when used incorrectly, to lower us to the lowest levels of impurity. As a Jewish teenager, I can tell u, we all search for inspiration. We search for purpose and meaning. We search for something to keep us up in good times, we all grasp for that proverbial hand to hold in the dark. For a great many of us, music is that “something”. Music is a huge part of our lives, so much so, that a lot of our memories are connected with specific songs and different phases of our lives are associated with different genres. BUT: there is a problem. As much as we look for inspiration in Jewish music, it’s very rarely there. The lyrics are mostly in Hebrew, very often pesukim. They are nice, and although on select Motzei Shabbosim with some beers, guitars, and our Rabbeim, we can be seen eyes closed, singing “L’maancha” at the top of our lungs around a campfire, and the words are poetic and meaningful in a broader sense, those songs don’t convey contemporary messages, they don’t directly apply to us and our specific issues, today. Also, a great many Jewish songs sound the same, using the same instruments, beats, progressions and arrangements. There is rarely something fresh to listen to, a new sound, a new idea. Many frum Jews look down on their children listening to non-Jewish music because most of the time it is replete with inappropriate words and ideas, full of vulgarity and immodesty, the opposite of what our people stand for as “baishanim”. Because, however, jewish music at this point does not appeal to today's teenage Jewish soul in the same fashion, what else should they do? Kids, especially today, want to listen to music they can appreciate, lyrics they can understand. They want to know that other people are going through what they are, that they will be able to push through, that everything will be alright. Instead, the Jewish music scene offers us “freilach” beats with too many trumpets and electric guitars, and Hebrew words that are sometimes tweaked to fit the beat, many times COMPLETELY not matching the mood of the song. (Take the popular song “Zachreini Na” for example. The lyrics are Shimshon pleading in Shoftim, begging Hashem to help him overcome the Pelishtim with might, so that they can be paid back for GOUGING HIS EYES OUT, and are set to a rock progression and an upbeat tempo.(!!!!) I’m sure Shimshon smiles in heaven every time he sees people dancing to that by a Jewish wedding...) Kids need lyrics they can understand, and therefore those lyrics should more often be written in English. BUT, the Jewish artists who do venture into the world of English lyrics are too afraid to ‘cross the line’ and sing about issues within Judaism, or things outside of Judaism, our world, people, places, experiences…they must remain very much within the tiny margin between inspiration and Judaism; they don’t want to ‘step on any toes’ by being the first ones to break out of the classic mold of Jewish English music, and they are worried (for good reason) that it won’t be accepted in the frum community. Many consider songs with English lyrics to be “goyish”. This should not be the case. A song should be judged on the content, not the language in which it is written. The same way many Jewish educational establishments have adopted the “smart board” system, using technological advancements to their advantage in chinuch, it is time for Jewish music to do the same, and use a new approach to transform itself, if not for the enjoyment of our adults, than for the souls of our youths. With this in mind, I think it is time for the Jewish community to change their mindset, and the more the listeners do, the more the artists will, and it will begin a cycle that will lead to an acceptance of music that is applicable to us, and is of enough quality to keep us away from seeking the same in less desirable places. Artists need to step outside of the line, and begin to experiment with different sounds and lyrics, and sing about real topics, applying to us, today, or else there is nothing to keep us from finding it in non-Jewish music. The frum community must do their part as well, by broadening their mindset a little bit, and being open to trying something that yes, may be uncomfortable to them, and may not be something they are used to, but is required to prevent the extinction of Jewish music. Frum producers, arrangers, and composers have the complete ability to begin making this type of more original, creative, “different” music, but they don't, because the frum audience doesn't want it. They are okay with what is produced today; this is the music they listen to, and this is the music they buy. The only problem with this is that the children and teens of these people AREN’T okay with it, and are therefore driven to seek musical enjoyment in other, potentially “non-kosher” places.I therefore ask you, the adults, to try to begin accepting the idea that music can be more inventive and, perhaps more importantly, applicable to today’s youth, so that the producers will sense that it is ok, (and profitable), and make music that is different from what we have become used to hearing. I believe it will be well worth it, because at the end of the day, even if it might be hard for the older segment of frum Judaism to see the face of Jewish music change, it’s about the younger segment and what THEY like, and what will attract them to love Torah and mitzvos through song. They are the future of klal Yisrael, and without them, there is no continuation of our legacy. Although yes, Jewish music will have a slightly different look, and may even sound radically different than it did before, it is worth it in order to keep Jewish music relevant. It’s a “lose the battle, and win the war” type of thing. At this point, it is almost over. The greats are nearing their ends, new artists with mediocre voices and a lot of money come and go every other week, the actual talent can’t afford to produce because no one buys albums anymore: people just rip, burn, download and steal; the artists lose piles of money. Wedding introductions and interludes are all non-Jewish anyway, and not to clean songs. What will be with wedding music, you ask? We have enough songs with Freilach and Hora beats to last us for a week-long wedding. Anyway, with what weddings have become, (concerts with food), no one dances anyway! Everyone just stands around the bandstand watching and videoing, until the kalla’s father realizes that his hiring that famous singer for the extra couple of thousand didn’t enhance his simcha, it ruined it! So let those people all stand around and listen to the new stuff! Jewish music needs a new start; something must be done before it is eliminated completely, either by people just listening to non-Jewish music by default, or by all the factors mentioned above. As a music enthusiast and occasional composer and singer, I decided to put these ideas into play in my own music. I have some songs on my YouTube channel, “Dreamer”, “Among the Thorns”, and others. I have tried, with these songs, to break the mold, to show that good, clean, and meaningful music can be made without Hebrew lyrics and a huge brass section. Now, being independent at this point and still only 17 years old, I was restricted regarding the scope of ideas I could incorporate, but just imagine what professional, older, and more established artists could do if they, too decided to take the step! When I first put my songs on youtube, I received about a hundred emails from listeners who wanted to thank me for inspiring them and for just being different than the classic stuff. On one of my songs, however, someone commented: “this does not sound like a Jewish song.” Did this person listen to the lyrics and try to take what he could from the message, or did he just hear the first English word of the verse and banish it to the dark corner of “goyish music”? One must also wonder if “Candlelight”, by the Maccabeats, originally “Dynamite” by Taio Cruz, which has since been made mainstream by multiple frum Jewish artists, is on his list of “kosher” music. Putting Hebrew words to a originally vulgar song is okay, but a Jewish song with English lyrics isn’t? Who decides what qualifies as Jewish music and what doesn’t? The answer lies with the artists and the acceptance level of the audiences. It is time for something new. They say “be the change you see in the world”, and “Bimakom Shein Ish, Hishtadel Liyos ish” etc. 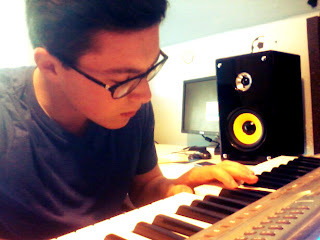 , so I do what I can by implementing these ideas into my own music, but I need your help. You, the artists; you the audience. It is time for something new. CLICK HERE TO SUBSCRIBE VIA EMAIL TO FUTURE POST! Yaakov, kol hakavod!!!!! And EXCELLENT article to go along with excellent songs! The Jewish music scene NEEDS a new direction and must be infused with fresh young minds. That is how our children will remain interested in the music...and how the music will keep our children close. Thank you, Yaakov. Thank you. Nice post. This is exactly why I do what I do. People need relatable Jewish music. Hopefully well see some more artists like that (including yourself) get some more exposure over time. Nice. Reminds me very much of Yossi Toiv's stuff on Or Chodosh 2. Right on target.. and very well written! And the song... is just beautiful!! I just think that instead of trying to change the mindsets of the older artists, continue doing what you're doing and the ones that want and need it will follow. By trying to change others (which will probably never happen), you will only loose time and focus on your own projects. And in the way things go these days, I somehow see it turning into some politics like everything does and you'll end up becoming famous by having an issur put on your stuff... And that would be a shame... because judging by your article and hearing your song, I hear a rising jewish star that will touch many hearts. i do not know why anybody would ever think this sounds goyishe!!!! only the pintle yid would appreciate this, sounds like a very special camp song.. I like the article and the music is heartfelt. Still, I wonder whether Yaakov fulfills the ambitious goal that he asks of the frum community. The music has Torah themes, but do they speak to contemporary youth's sense of alienation and search for meaning? Kol Hakavod for having the courage to write this article and start the conversation. real music... usually comes from real musicians who work hard at developing their craft over a life-time. singers as well, may have a gift, but they have to work at being in tune..and many other aspects of beautiful singing. today, unfortunately, people think they can make music (and money!) by simply using machines...without the years of practice, study and devotion needed to be a real musician. the culture encourages this, rewarding people who can't really sing or play. people should be encouraged to learn real instruments and learn how to sing in tune. otherwise, what will happen to music? does anyone really want the future of music to be in the hands of mediocrity and simplistic, out of tune, mechanically driven sound? real music takes practice. it takes dedication. the result is being able to play or sing in tune and hopefully do something that helps people. Sunshine by Miami Boys Chior, On Giants Shoulders by Avraham Fried to name a few of the top of my head, and many others have been English lyrics. got somtin going.he for sure is touching the soul!kol hakovoed. Yaakov: I read about you on Dovid Teitelbaum's blog. I've posted your music on my blog "American Trial Attorneys in Defense of Israel." I devote alot of my blog to Jewish music. I'm a fellow YFR alum. Your words ring true. No that would be Yisroel lamm . The clarinet is not a horn instrument?! 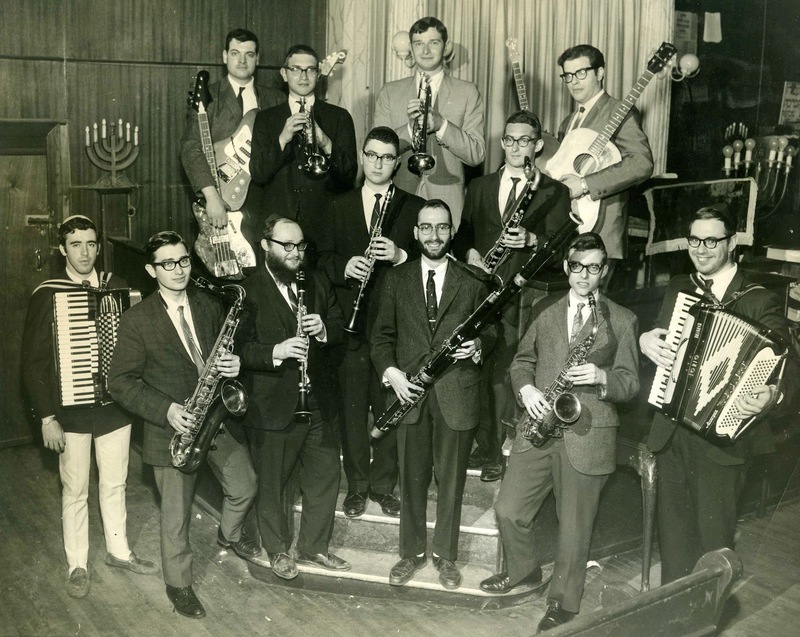 In the photo of the pirchei band, is the man identified as Feivy Mendlowitz the same person as the "Unorthodox Jew"? Why the new system for the comments? As I am quiet new in Jewish, looking around for some Jewish information> Got something important here. Nice to get it.